Start by adding the flour, the yeast, the sugar, the salt, the eggs, the milk, and the butter into the mixer. Mix the ingredients on low for 5 minutes until it becomes shiny in appearance. Add about 2 Tbsp more of flour to the bowl and turn off mixer. Now scrape the dough from the hook. Put a little flour inside the bowl and also sprinkle some on your work table. Now knead the dough briefly. Add a little more flour to the bowl and sprinkle a little onto the dough. Return the dough to the bowl. Cover it and let it rise for about 1 hour or until it has doubled its size. While the dough is rising you can place into a bowl the brown sugar, the cinnamon, and the butter and mix with a spoon until combined. Now set it aside. You can now set the oven to 185 degrees Celsius. Punch the air out of the dough. Sprinkle the work space with flour and place the dough on it. Sprinkle the dough with some flour. Now roll out the dough to a 1/2 cm thickness, making sure there is enough flour to prevent it from sticking to the table. You can now spread the filling on the dough. Carefully roll the dough into a log and cut it into slices of about 3 cm in thickness. Place them on the lined baking tray, leaving enough space for the rolls to rise. Allow them to rise for 15-20 minutes. Take your egg wash and using your brush, paint each roll individually. Put the tray into the oven and let them bake for 12-15 minutes. Remove the tray from the oven and let the rolls cool a bit. Your Cinnamon Rolls are now ready to serve. They can be eaten cold but they taste especially good warm. Try them both ways! 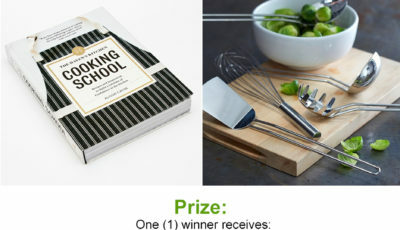 Enter To Win: Your Life After 25’s Haven’s Kitchen Cooking School Prize Pack Giveaway!